In a series of high profile hacks, 'Syrian Electronic Army (SEA)' just a few minutes before took control twitter account and website of 'GlobalPost', a US based news agency. 'Syrian Electronic Army is an organized hacking group loyal to the Syrian President Bashar al-Assad and known for their high profile cyber attacks. The hacker posted two tweets from the victim's account, saying "Think twice before you publish untrusted information about Syrian Electronic Army" and "This time we hacked your website and your Twitter account, the next time you will start searching for new job :)" (as shown in the screenshot). 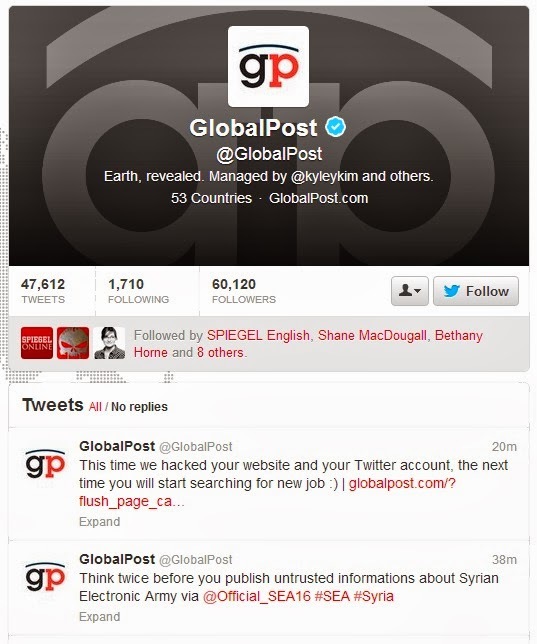 GlobalPost's Deputy Social Media and News Desk Editor 'Kyle Kim' also tweeted that "We've been hacked". At this point it is unclear that How group managed to access the website and twitter account. We are connecting to the hackers for further information, stay tuned to the page for more updates on this. Update (5:31 PM Monday, September 30, 2013 GMT) : According to the group, just after the hack GlobalPost website is taken down. 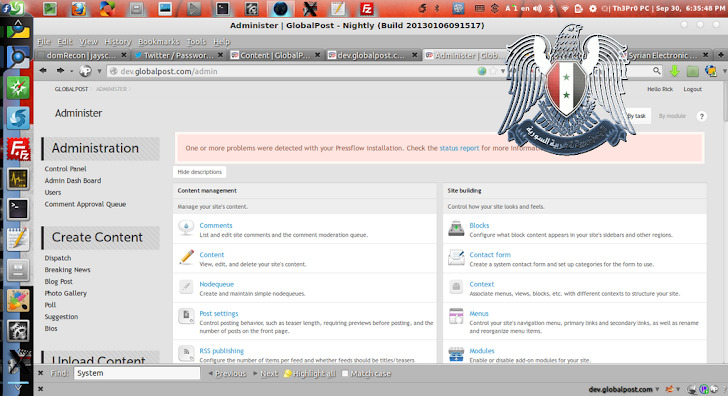 Update (6:33 PM Monday, September 30, 2013 GMT): On asking the reason of hacking, Syrian Electronic Army hackers explained The Hacker News that GlobalPost published innocent peoples' names in their article (Link) and said that they are "SEA members". "We were able to delete that article, but we didn't, we leave the choice for them." they added.